In a recent statement, the United States pledged to phase out anti-personnel landmines by allowing its current stockpile to dwindle and take steps to comply with the treaty banning the use of these weapons that kill around 20,000 people per year. US officials made the announcement at the Third Review Conference of the Ottawa Convention in Maputo, Mozambique on June 27, 2014. The ambassador stated that the US is working hard to find solutions or alternatives to antipersonnel mines that would be compliant with the Mine Ban Treaty and would eventually allow the US to accede to it. According to the announcement, the US will discontinue producing or otherwise acquiring antipersonnel mines, and will not extend the shelf life of stockpiled mines as they expire in coming years. The Pentagon has disclosed that the US has 3 million stockpiled antipersonnel landmines, much lower than the previously estimated 9 million. This is due to ongoing destruction and expiry of stockpiled mines, which deteriorate with time. It is expected that the stockpiled landmines will decline in function within 10 years (2025) and be unusable after 20 years (2035). Antipersonnel landmines are indiscriminate explosive weapons, which are designed to kill or maim people who step on them or come in close proximity to them. Because there is no specific target and no one controls the detonation, antipersonnel landmines are referred to as victim-activated weapons. They can lie dormant for years or decades, and kill thousands of civilians, many of which are children, every year. The Mine Ban Treaty, adopted in 1997 and enforced in 1999, prevents the stockpiling, use, production and trade of antipersonnel landmines and covers landmine clearance and victim assistance. Currently 161 countries worldwide are party to the Mine Ban Treaty, however major powers such as Russia, China and the US have refused to join. Although the Clinton administration did not sign the Mine Ban Treaty when it came into effect in 1999, the US did decide to prohibit the use of ‘persistent’ landmines everywhere in the world except on the North/South Korean border, destroying over three million antipersonnel landmines in 1999. Clinton proposed to sign by 2006; however the Bush administration changed the policy in 2004 declaring never to become party to the Mine Ban Treaty. 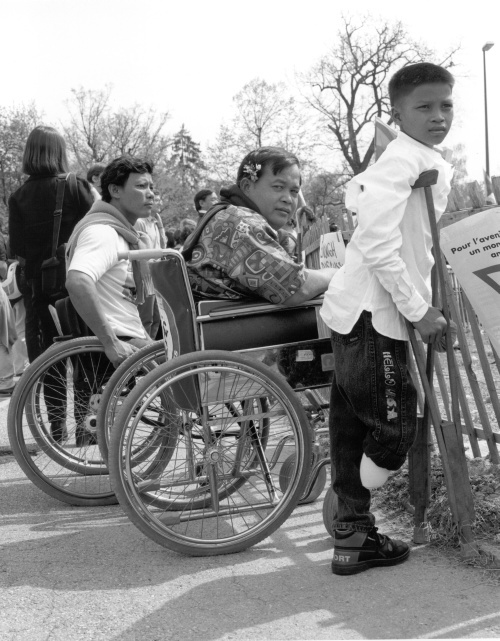 Activists involved in the International Campaign to Ban Landmines, of which SafeGround is a member, have long pressured the US to become party to the treaty. Although Washington has never signed, the US has expressed support for aspects of the treaty and the latest announcement builds upon recent commitments to comply with treaty obligations. In 2011, the Obama administration committed to refrain from using “persistent” anti-personnel and anti-vehicle landmines, which do not self-destruct on impact. US officials pointed out that latest announcement does not necessarily reflect the final outcome of the US landmine policy, which has been under review since 2009 under the Obama administration. The announcement does not currently prevent the US from using “self-destruct” antipersonnel mines, which are prohibited under the Mine Ban Treaty. Despite not being party to the treaty, the White House issued a statement that “the United States shares the humanitarian goals of the Ottawa Convention”. The US is globally the largest donor to landmine clearance and victim assistance, donating more than $2 billion in aid since 1993.